Time travel and theory of relativity are still science-fiction subjects for present day human beings. But in puranas, they’ve been discussed multiple times. 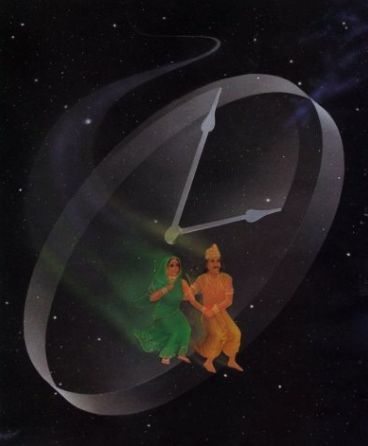 One such classic example is that of King Kakudmi and his daughter Revati, who travelled to different loka (dimension) and returned to earth in future time. Kakudmi was a descendant of the Sun Dynasty (Suryavansha). Kakudmi’s daughter Revati was so beautiful and so accomplished that when she reached a marriageable age, Kakudmi, thinking no one upon earth was worthy of her, went to the Creator himself, Lord Brahma, to seek his advice about a suitable husband for his daughter. When they arrived, Brahma was listening to a musical performance by the Gandharvas, so they waited patiently until the performance was finished. Then, Kakudmi bowed humbly, made his request and presented his shortlist of candidates. Brahma laughed loudly, and explained that time runs differently on different planes of existence, and that during the short time they had waited in Brahma-loka to see him, 27 chaturyugas (a cycle of four yugas, totalling 108 yugas, or Ages of Man [refer Concept of Time Division in Ancient India and Age of Brahma]) had passed on earth. Brahma said to Kakudmi, “O King, all those whom you may have decided within the core of your heart to accept as your son-in-law have died in the course of time. Twenty-seven catur-yugas have already passed. Those upon whom you may have already decided are now gone, and so are their sons, grandsons and other descendants. You cannot even hear about their names. King Kakudmi was astonished on hearing this news. However, Brahma comforted him, and added that Vishnu, the preserver, was currently incarnate on earth in the forms of Krishna and Balarama, and he recommended Balarama as a worthy husband for Revati. Kakudmi and Revati then returned to earth, which they regarded as having left only just a short while ago. They were shocked by the changes that had taken place. Not only had the landscape and environment changed, but over the intervening 27 chaturyugas (mahayugas), in the cycles of human spiritual and cultural evolution, mankind was at a lower level of development than in their own time (see Ages of Man). Daughter and father found Balarama and proposed the marriage, which was accepted. Since Revati came from different time behind him, she was taller than Balarama. So, Balaram used his plough to reduce her height according to present conditions. Their marriage was then duly celebrated. Muchukunda (ancestor of Sri Rama), son of King Mandhata, was born in the Ikshvaku dynasty (Suryavansha). In a battle, demons dominated the deities. So, Indra the King of deities requested King Muchukunda to help them in war. King Muchukunda agreed to help them and fought against the demons for a long time. Since the deities did not have an able commander, king Muchukunda protected them against the demonic onslaught, until the deities got an able commander like Kartikeya, the son of Lord Shiva. Then Indra said to the king Muchukunda, “O king, we, the deities are indebted to you for the help and protection which you have given us, by sacrificing your own family life. Here in the heaven, one year equals three hundred and sixty years of the earth. Since, it has been a long time, there is no sign of your kingdom and family because it has been destroyed with the passage of time. You came here in Treta Yuga and now its Dwapara Yuga on earth. We are happy and pleased with you, so ask for any boon except Moksha(liberation) because it is beyond our capacities“. While fighting on the side of the deities, king Muchukunda did not get an opportunity to sleep even for a moment. Now, overcome by tiredness, he was feeling very sleepy. So, he said, “O King of the deities, I want to sleep. Anyone who dares to disturb my sleep should get burnt to ashes immediately“. Indra said, “So be it, go to the earth and enjoy your sleep, one who awakens you would be reduced to ashes“. Kalayavan (Yavana/Yona/Greek) warrior king was undefeated and unmatched in battle due to a boon, but he was also merciless and cruel. He learns that Krishna is the only person who can defeat him in battle and accepting this challenge sets out to invade Krishna’s kingdom, Mathura. When the two armies faced each other in battle, Krishna dismounts from his chariot and starts walking away, followed by Kalayavan. After a long time Krishna, followed by Kalayavan, enters a dark cave. In this cave Muchukunda was sleeping since the time he was blessed by king of deities. The person on whom Muchkunda’s gaze falls is doomed to instantaneous death. Kalayavan in a fit of anger and unable to see in the dark attacks Muchukunda mistaking him to be Krishna. When Muchkunda opens his eyes, his gaze falls on Kalayavan who is immediately burnt to death. Krishna appears to Muchukunda in form of Ananta Padmanabha Swamy (same position in which muchukunda slept for many years). The river which starts its flow from near that cave is now known as Muchukunda Nadi(River). In time lapse, it is known as Moosi (Musi) River, which flows through Hyderabad in Deccan Plateau, India. Tripura Rahasya, the ultimate book on Advaita Vedanta discusses a chapter about time-travel. Mahasena, brother of Vanga King Sushena sent his army along with horse to perform Aswamedha Yagam. When the army crossed a sage named Tangana, who was in meditation, they did not pay respect to him and proceeded further. Sage’s son noticed the insult to his father and was exasperated. He caught the sacrificial horse and fought the heroes guarding it. They surrounded him on all sides but he together with the horse entered a hill (Gandasaila), before their eyes. Noticing his disappearance in the hill, the invaders attacked the hill. The sage’s son re-appeared with a huge army, fought the enemy, defeated them and destroyed Susena’s army. He took many prisoners of war, including all the princes and then re-entered the hill. A few followers who escaped fled to Sushena and told him everything. Sushena was surprised and said to his brother to respect the sage and bring back the horse. Knowing the problem of king, Tangana asked his son to release the horse. But even after that Mahasena was curious to know how huge army emerged from inside a hill. 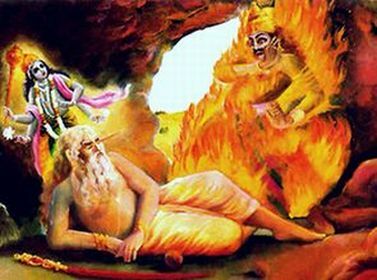 Tangana’s son made Mahasena leave his physical body outside the hill and took his ativahika sarira (astral body) inside. Outside the hill, sage’s son made Mahasena go into sleep and united his astral body with the preserved physical body. When Mahasena wokeup, he found the whole world to have changed. Upon realizing that all his relatives and friends were dead during that time period, Mahasena goes into depression. Tangana’s son takes him around the hill and says ‘See this hill’s circumference is just 1 mile, but you have seen a huge universe inside. Now what can you call as reality ? How can you judge if one dream is reality of actually a dream, based on another dream ? Thus Mahasena was taught yoga and advaita philosophy.